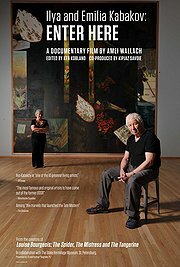 Ilya and Emilia Kabakov, the husband-and-wife team of conceptual artists, are the subjects of the doc Ilya and Emilia Kabakov: Enter Here. Director Amei Wallach films them as they prepare for an exhibit in Russia years after they left there to live in the U.S. Listening to them discuss their younger days in Stalinist Russia provides some fascinating and somewhat moving insight. It also helps to add warmth and to humanize them rather than just show what they're like as artists. There's no denying that they have genuine artistic talents; looking at their artworks speaks louder than words. Wallach does her best to encapsulate the Kabakov's brilliance while keeping you absorbed/engaged, but that absorption/entertainment gradually becomes undermined by the pretentious editing by Ken Kobland. The subtitles aren't always on the bottom of the screen, and at one rather unintentionally funny scene, they literally wrap around the screen so you have to read them sideways and upside down. Those and many other editing choices feel distracting, awkward and frustrating. Ultimately, this doc is a warm, human portrait of two brilliant artists undermined by pretentious, distracting editing and cinematography. Festival Diaghilev P.S. and JTI releases it at the Film Forum. Over at Quad Cinema you'll find the doc Lion Ark, released by ADI Films, about Animal Defender International's mission in Bolivia that rescued 25 circus lions and transported them to a sanctuary in Colorado. Jan Creamer, co-founder of ADI, leads the mission which is much more intense and complicated than one would expect. Bolivia passed a law in 2009 banning the use of animal performers, but some circuses decided to ignore the law while undermining the welfare of the circus animals. Tim Phillips includes footage of circus employees abusing the animals which will make you cry one minute and enraged the next, but he wisely doesn't dwell on those potent images. That makes the footage of ADI members rescuing the lions all the more thrilling, relieving and uplifting. You might even find yourself wanting to stand up and cheer. 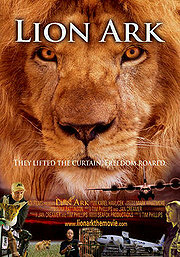 What starts as tears of sadness soon turn into tears of joy which shows you just how moving Lion Ark feels. Admittedly, some of choices of music are a bit bizarre because they don't compliment the images particularly well, but those are systematic problems and they're sporadic. If you're not moved by Lion Ark, you must be made of stone. 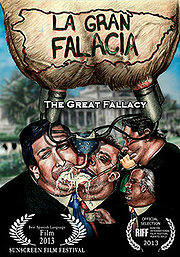 The Great Fallacy, released by Jibaro Media Group, tackles the issues of sociopolitical and economical problems found in Puerto Rico. Much like the U.S., Puerto Rico suffers from a wide gap between the 1% wealthy people and the 99% who are essentially enslaved to the 1%. TV dumbs the masses down and comes with propaganda. The 99% pay for the economic crisis which, according to experts, was engineered by the Puerto Rican government. Director Paco Vázquez includes many talking heads along with fact/figures and quotes which provide some insight, but there's not enough variety and thoroughness when it comes to the perspectives and any analysis of the fact; the same could be said about the primarily one-sided Inside Job which didn't even incorporate the wheel that makes the economy turn: the banking regulations known as the Basel Accords. Once The Grand Fallacy reaches its 1-hour mark, it repeats itself over and over and starts to drag. Tighter editing would have solved that systemic problem. It opens at the Quad Cinema.